Results are in for the 2018 ANUSA elections, and five delegates to the National Union of Students (NUS) National Conference (NatCon) have been elected. The successful candidates were Tanika Sibal (Refresh), Lachy Day (Refresh), Niall Cummins (Ignite), Ashish Nagesh (Reform), and Croft Sun (Refresh). The NUS, as the peak representative body for undergraduate students in Australia, seeks to serve the interests of undergraduates – through advocacy, lobbying the government, and conducting campaigns, conferences, and protests. While the NUS is managed day-to-day by a National Executive, it is governed by elected delegates from each accredited university. At the end of each year, these delegates take part at NatCon, where they decide on NUS policy and elect office bearers for the next year. At this point, it is unclear if the delegates elected as NUS delegates from ANU will have voting rights. Last year, ANUSA refused to pay membership fees to the NUS after a number of transparency and accountability-based Key Performance Indicators (KPIs) were not met, and thus NUS delegates acted as observers without voting rights. This year, ANUSA collaborated with seven other student unions around the country to send joint KPIs to the NUS, although some of those unions later backed away from the KPIs. If these KPIs are not met, ANUSA says it will not pay accreditation fees, meaning that once again the NUS delegates would be observers rather than voting representatives. For more on the NUS and NatCon, read our explainer here. NUS Delegate candidate and General Secretary-elect Lachy Day committed that all Refresh Delegates would sit with the National Independents (Indies) at the NUS National Conference (NatCon). The National Independents are a broad, generally progressive association of independents, who never bind votes (demand that members of the faction vote a certain way on a motion). The Indies are formed from a number of independent student representatives across the country, who find they have more collective knowledge and bargaining power if they work as a group. At last year’s NatCon, the Indies controlled 9.7% of the conference floor. Refresh delegates commit not to be bound by factional groupings. Refresh supports livestreaming of NUS NatCon, which they say will improve behaviour on conference floor, however Day suggested that safety concerns would justify non-livestreaming of ANUSA SRCs. Refresh also supports autonomous voting for NUS Department Officers, and wants to pay them. They would achieve this by voting as the autonomous ANUSA Departments direct them. Refresh also promises to “undertake consultations with the student body to see where you stand on issues concerning the NUS” before NatCon. When asked whether the NUS is an effective platform for political debates beyond student advocacy, Day noted that broader issues can be intersectional and therefore relevant to students and that the NUS’s large constituency gives it power to affect change. Refresh says it will leave the issue of NUS accreditation to SRC, which it will likely control, given that out of the 39 positions on SRC, they already have had 14 candidates elected unopposed. Sibal is also running for Education Officer within ANUSA. In Refresh’s NUS policies, they said that Sibal would probably support collaborating with the NUS on National Days of Action if elected Ed Officer. Sibal attended the NUS’ Education Conference (EdCon) as an independent delegate earlier this year. Sun has also been elected CBE rep unopposed. Last year, she ran for that position independently, but was not elected. Sun focuses on international students in her manifesto, promising that “As an independent, I will work hard to try and make the NUS more accessible for international students”. 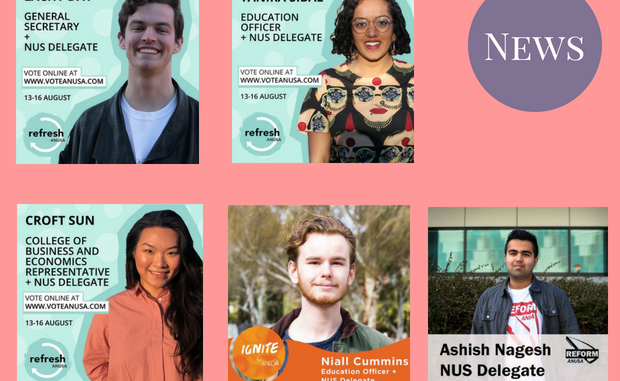 Ignite is running a full NUS ticket of five candidates this year. Ticket Convenor Niall Cummins, a self-described “proud member of Student Unity” personally committed to sitting with Student Unity (Unity) at the Observer NUS debate. The other Ignite delegates are also all members of the Labor Student’s Club at ANU (Labor Right) and so presumably will also sit with Unity. Affiliated with Labor Right, Unity has been the largest faction in recent years. Unity draws support from a number of different Labor Right factions, with its heartland in Victoria. A significant amount of Unity support is affiliated to the relatively conservative Shop, Distributive and Allied Employees Association (SDA), and are relentlessly pro-union and pro-solidarity. Unity binds its voters to vote for party-approved policies and candidates, and indeed a significant number of its votes are proxied to trusted Unity delegates to avoid any chance of losing votes on the floor. At last year’s NatCon, the faction had 44.7% of floor votes, and commanded a majority of the floor thanks to Liberal proxies. Cummins will consider himself bound by his faction, as Unity enforces binding. He noted that Unity nearly had a majority of votes last year and that he would represent ANU interests within Unity caucus. Cummins voiced opposition to livestreaming of NatCon, saying in the debate that it was not a “magic bullet as transparency” and had many of the ‘safety concerns’ that led to ANUSA banning SRC livestreaming. Cummins backs the conference floor’s ability to elect department officers; he cited the NUS welfare officer (a Unity member) as an effective example. Cummins does not think it is a primary role of the NUS to involve itself in broad political debates, quipping that its motions were yet to resolve the Israel-Palestine conflict. Cummins himself has significant experience within the NUS as a General Member of the NUS National Executive for 2018. Cummins is also a candidate for ANUSA Education Officer this year. Observer understands that all of Reform’s candidates are Liberal party members other than Rishi Dhakshinamoorthy (who is a member of the ANU Liberal Club), and presumably would sit with the Australian Liberal Students Foundation (ALSF) at NatCon. The ALSF is generally associated with the Liberal Party, despite no official links to the senior political party. The Liberals have generally had little power at NatCon, both due to a low voter base amongst students and because Liberal-controlled universities have a habit of disaffiliating from the NUS. Liberals have found themselves the particular target of verbal abuse at NatCon in a number of well-publicised incidents, often perpetrated by SAlt. Last year, their 6.1% of votes went to support Unity, pushing the latter to an absolute majority. At the Observer NUS Debate, Rishi Dhakshinamoorthy, representing Reform, called for a referendum on ANUSA’s membership of the NUS. Reform supports livestreaming of NatCon and Dhakshinamoorthy also supported autonomous election of department officers. Nagesh was a Gen Rep this year. He says in his manifesto that “I will fight for live streaming, full financial audits of NATCON and ensure that The National Union of Students (NUS) is not wasting our Student Services and Amenities Fee”. Nagesh is the current Secretary of the ANU Liberal Club. Left Action, a ticket associated with the Socialist Alternative faction, is running candidates for the first time in recent years at ANU. Candidate Wren Sommerville committed to sitting with the Socialist Alternative (SAlt) faction at the Observer NUS delegate debate, and the other members of the ticket will presumably also sit with the faction. SAlt (also colloquially known as the Trots) are a Marxist faction that is perhaps the most combative at NatCon. SAlt’s unrelenting focus is student activism and economic injustice, and are particularly fond of in-your-face protests. SAlt, too, bind their votes, and employ the judicious use of proxies to prevent floor revolts. SAlt held 16.6% of the conference floor at NatCon last year. At the NUS delegate debate, Sommerville committed to being bound by her faction, as are all other SAlt delegates. At the debate, Sommerville said she notionally supported livestreaming of the conference – however, SAlt abstained on a livestreaming motion at last year’s NatCon. At the debate Sommerville also voiced opposition to autonomous groups electing NUS Department representatives. The issue is particularly relevant at present as earlier this year, the Queer Collaborations conference, an annual conference of queer* students around Australia, voted a motion of no confidence in NUS Queer/LGBTI Officer (and SAlt member) Jasmine Duff. This was partially in response to allegations of Duff allegedly intentionally misgendering someone on the conference floor of NatCon. Last year, Queer Collaborations endorsed Dylan Lloyd for NUS Queer Officer, however he was locked out of the position thanks to factional deals at NatCon. The ANUSA Queer* Department have also recently passed a motion of no confidence in Duff. No Left Action candidates were elected. An earlier version of this article mistakenly stated that Niall Cummins was elected on Refresh. He ran on Ignite.